Someone needs to do it. There are a few overlaps with my experience in local politics and state politics, and one of them is that our elected officials only know what is important to their constituents if we tell them. So go testify, and tell them what matters to you! Read on, and I’ll tell you what it’s like… a real woman’s story of speaking my mind in Wisconsin. Today’s adventure started on Saturday, when I was with some of my TU friends, and our colleagues at the River Alliance let us know that the hearing for AB847 (Assembly Bill 847) had just been scheduled for today, at 11:00. In a nutshell, this bill has to do with permitting high capacity wells and how we want to deal with the permitting process for these wells in the future- granting permits in perpetuity, regardless of the well being repaired, replaced, or the property being sold. Those of you who know me politically will not be surprised that I advocate for science in groundwater, and support periodic review as our technology improves and we are able to get better data. This bill is the opposite of what I believe in, so I planned to rearrange my schedule to attend. Out of our legislative committee for Wisconsin TU, two of us could attend the hearing. This hearing wasn’t as rushed as some are- I am always angered when a bill only gets the minimum 24 hour notice before a public hearing. How can our legislators expect the public to come to a meeting with less than a day to rearrange our schedules? From what I understand, in that situation, they don’t. They don’t want us to come and voice our concerns. Even though I had a couple days to get ready for this hearing, I didn’t make time to prep my testimony until today. It wasn’t so bad, since I testified at this bill’s Senate partner (SB239), so I know what the bill is about, and I was thinking about my statement in advance. In preparation for this hearing, I woke up early this morning, typed out my testimony, and packed up to hit the road by 8:30. Once I got to Madison around 10:30, I had a major “country mouse in the city” situation. I know of two public parking lots near the Capitol. I’m sure there are more, but I’m not familiar with them. Both lots were full. I drove a loop between the two lots probably five or six times, and couldn’t decide what to do. I didn’t see any street parking beyond 25 minutes, and the last hearing I went to lasted over four hours. What do I do? Keep driving around? Turn around and go home? Cry? I started to sweat a little bit, and wondered if I could manage to take off my winter jacket while driving in downtown Madison traffic. I kept driving. It was 10:42. I found a spot on the street, for maximum two hour parking. I pulled a U turn, snagged the spot, and jumped out of the car. The -10 windchill hit me like a ton of bricks as it took my breath away. I grabbed my wallet and ran to the parking meter, praying that I had enough change to feed it. I put in every quarter, dime, and nickel I had, including a Canadian quarter. That one didn’t count, but I’d bought myself one hour and 58 minutes. I grabbed my purse, camera bag, and coffee, and hustled up the hill to the Capitol. It was 10:46. …and ran up to the second floor, North wing, where the hearing was being held. I found my TU friend, Mike, and we sat together. 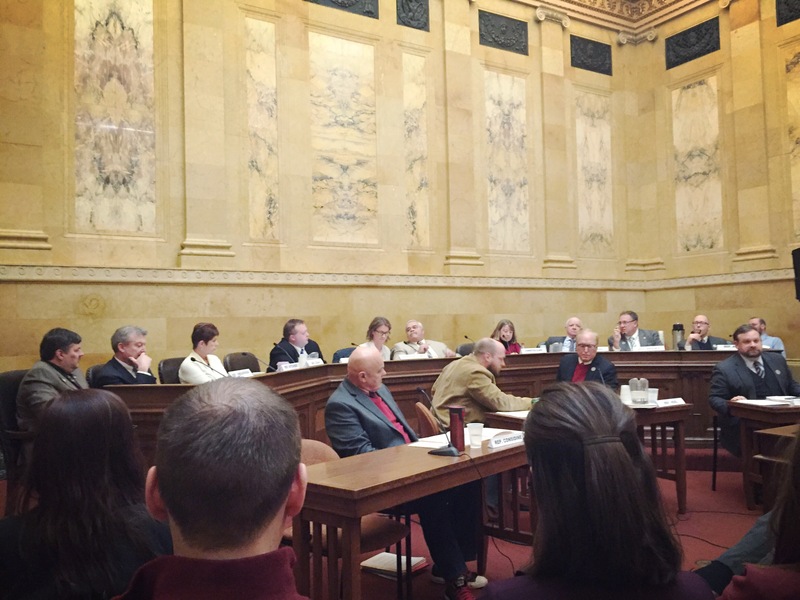 My friends from the River Alliance and Wisconsin League of Conservation Voters were there to testify and lend support as well. It was a beautiful room, despite the stifling feeling I get when in a room full of passionate people in suits who are better at playing this game than I am. When you come to a hearing, you sign in. You can register to testify, if you want, or you can just sign in and indicate whether you’re in favor or in opposition to the bill in question. I filled out my paperwork and gave copies of my testimony to the clerk to distribute to the committee members. I was nervous, because I needed to be back in Stevens Point by 3, so I hoped that they’d call me to testify within the first two hours. I mentioned that to the clerk, and she was very kind, saying she’d see what they could do. She, and the chair of the committee, both smiled at me. What luck! While I’d been disheartened by the partisan politics of other water bills during the executive session, I was filled with hope that these legislators actually did want to hear from an average, authentic person. Of course, then I realized that I was going after (and, as it turns out, between) a professional. A lobbyist. I sat down in the leather chair, and made my token name joke. “It’s Oberstadt. I married a German man. Taking that new last name is a sign of the depth of my love.” The committee gave a little chuckle. Then, I took a deep breath, and started my planned testimony. Good afternoon, Committee on Environment and Forestry: Thank you for staying for this hearing and giving me this opportunity to speak with you. I’m Heidi Oberstadt, a small business owner in Stevens Point, right in the Central Sands. I’d never driven down to testify until I saw this bill’s partner, SB239, in the Senate… so I’m new at this and nervous, but this bill’s possible impacts are important to me. I hope I’m in good company here with people who care about our environment and our water. With all the time that I spend playing outside, I’ve seen some pretty clear signs that we have an existing groundwater problem manifesting itself in visible surface water problems. If you haven’t seen them yet, you will- photos of our troubled Central Sands water- with visible stream beds and docks that seemingly lead to nowhere. This isn’t a future problem, it’s a current problem. You are being pulled in a million directions on recent legislation, so as someone who has literally watched this growing problem, I can offer a unique and authentic perspective. With this visible problem, the only legislative option that I can support is a science-based solution that not only helps our citizens who are currently affected, but ensures that science will be used in the future to protect our groundwater for generations of Wisconsinites. I don’t have children yet, but I want to be able to show my future children the beauty of my home water someday. Please help me do that, and oppose this bill. When I finished, as per usual, the chair asks the committee if they have any questions. Only one member raised their hand, and my heart skipped a beat. What could he possibly ask me about? Big smiles from me. I stood up, and was immediately replaced with a lobbyist for big dairy farms. I wish I could have stayed for the rest of the hearing, but I had to leave. I still have work to do! In fact, I’ll be working late tonight to make up for the hours that I missed while driving and testifying. I know that testifying isn’t convenient for most people, and it isn’t easy- my voice was shaking the entire time I was speaking! The reality of the situation is that I don’t know if my voice will make a difference, but I hope it does. If we waited until it was easy for us to speak our mind, we will have missed our chance. Be brave, friends. If something matters to you, fight to protect it! I’m here to help, if you need a pep talk.